Having installed hundreds of wood burning, pellet burning and multi fuel stoves across France, we firmly believe that a stove is the best present you could buy for your home and family this year. Let’s face it, when it comes to festive cheer, it’s hard to beat the look and feel of a wood burning stove or similar. With a glowing fire spreading warmth throughout the room, stoves provide a stunning focal point. We offer a variety of styles for just about every size and type of room you could imagine, so you’re sure to find one that meets all your needs and exceeds your expectations. The festive season is fun but can stretch the household budget. 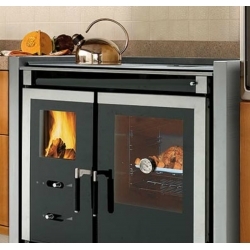 So, if you’re looking for energy bill savings, a stove is the gift that just keeps giving. Here in France, you can qualify for a tax credit, Crédit d’Impôt Transition Energetique, if you’re carrying out restoration work that improves your property’s energetic performance and efficiency. To be eligible, your stove must achieve a minimum energy efficiency of 70% – we have a huge selection of stoves whose efficiency ranges from over 70% up to an incredible 84.1%. Choosing the right type of stove for your home is essential, but don’t be discouraged if you feel your room is either too large or too small to be suitable for a stove. Substantial, double-sided wood burning stoves can effectively heat even very big spaces, while a compact pellet-burner – with easy storage for the fuel pellets – are a great option for a more intimate home. By making an informed choice based on expert advice and employing professional installers, you can make your Christmas wish for a beautiful heating solution come true this year.